The Starla blue Sapphire and diamond halo engagement ring features a solitaire effect cluster of intense blue sapphires, surrounded by a circle of gleaming white diamonds, styled in a wedding ring friendly ring design. 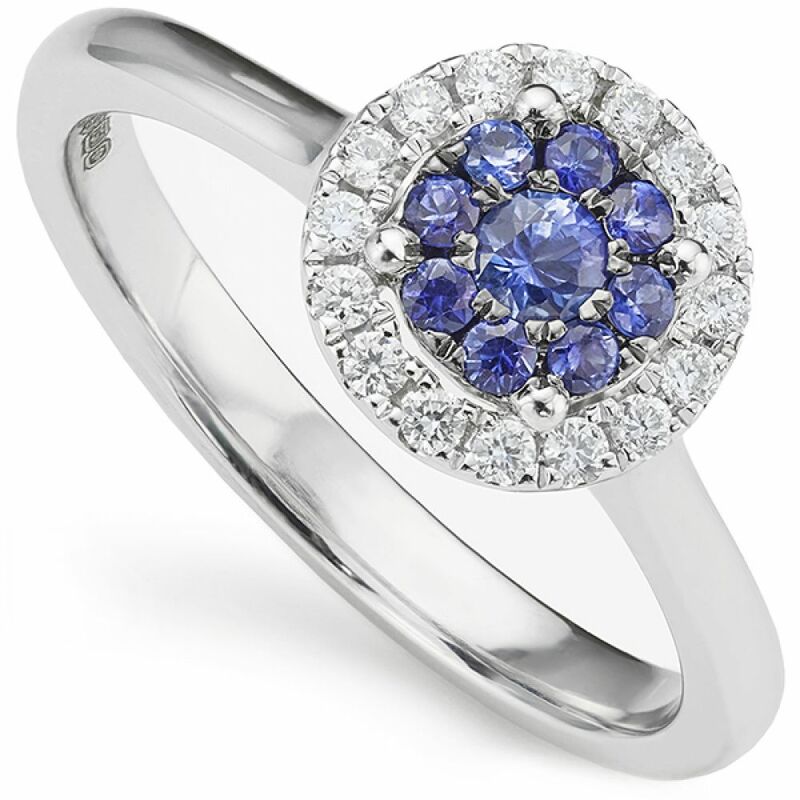 Experience the eye-catching beauty of the Starla Blue Sapphire and Diamond halo Engagement Ring. 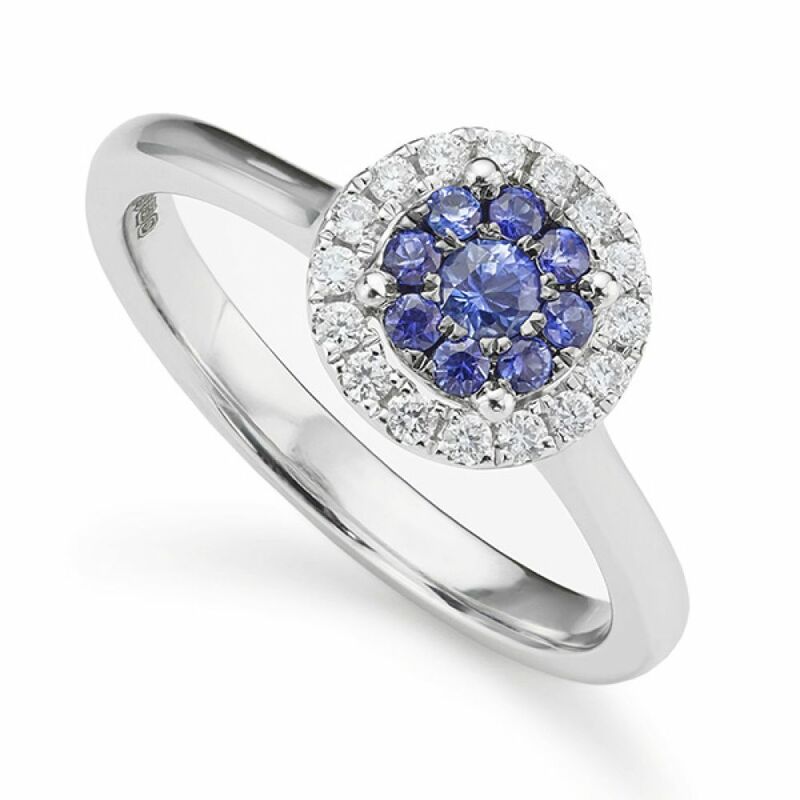 At the heart of the ring, a rich, compact cluster of intense Blue Sapphires sparkle within a halo of brilliant white Diamonds. Benefitting from a Wedding Ring friendly setting the design also features two further accent Diamonds below elegantly graduating shoulders, flowing from the 2.5mm wide comfort fit band. Website specifications are ready-made items available for immediate delivery. Please note that half finger sizes will require approx. 1 week to complete. This exquisite ring design features a total of 0.33 carats of sparkling gemstones which have been graded G Colour and SI1 Clarity, styled in a vibrant contrasting 18ct White Gold halo ring design. Beautifully boxed and packaged with secure courier delivery. Shown beautifully boxed, the Starla blue sapphire and diamond halo engagement ring features a wedding ring friendly setting, with additional diamond accents on either side, below the setting. The span of the setting measures 8mm from edge to edge across the finger.